Over a 1 month term. Apply Now For An Instant, Online, No Obligation Loan Offer. On average Swift Money® approve over 97.5% of all cash loan applications. Representative Example: Borrow £250 for 30 Days. Total Repayment: £310.00. Interest rate: 292.25% pa (fixed). 1255.66% APR representative. Instant Cash Loans From 1 to 12 months. In the simplest terms possible, cash loans can be defined as small loans taken to cater for emergency cash needs. The loans are usually unsecured which means they aren’t taken against assets like cars or homes. Although different cash loan providers have different terms, you need a pay slip or proof of income to get a cash loan. But most importantly, you need a reliable lender like Swift Money. Cash loans are meant for catering to unexpected expenses such as; home repairs, a hospital bill, a car repair bill, rent arrears (due to a temporary reduction in your income) or a home appliance bill (because you need to repair or replace your microwave). Taking a personal loan for emergency cash needs? Are personal loans better alternatives to cash loans? Typical short term loans aren’t ideal in emergency situations because the least you can borrow is £1000 and most emergency cash needs can be catered for less. Furthermore, if you take a standard personal loan, you’ll be forced to borrow money over a longer period (at least one year), yet you just need a small loan to get you to the next payday. Taking a personal loan can turn a small cash emergency into a straining long-term financial commitment. What are cash loans for? • Repairing or buying a new home appliance like a microwave. You can get emergency cash from three main places namely; friends or family members, high street loan providers or dedicated websites (lenders/brokers). Each of these sources of emergency cash has pros and cons. Almost everyone has borrowed money from friends and relatives, however, it’s not an ideal option when you don’t want everyone around you to know your ''business''. Furthermore, you may already have an unpaid loan, so you find it difficult turning to the same people for help. You also risk straining your friendship/relationship with your friend/s or family member/s if you are not sure about the repayment date. Borrowing from friends and family members may be a fast and great option (interest-free); however, you risk damaging your core relationships if you have repayment problems. It’s also a bad option when you need more than £100. Almost all high streets in the UK have loan providers. There are countless pawnbrokers and high street loan providers ready to offer loans in the UK. These loan providers have pros and cons. • Great for settling local financial commitments: You can visit a high street loan provider personally and fill in an application. If your loan is approved, you can get money the same day. • Not convenient if you live out of town. You need to visit high street loan providers in person. • Expensive: High street loans usually attract a higher interest than most short-term loans. Furthermore, you need to incur transport costs to access the loans. Let's not even discuss the time value of money. • Can take longer than a day if the lender needs additional documentation such as proof of income. If you don’t want to borrow from your friends/family or high street loan providers, online cash loans are a great alternative. They are the best alternative for you when you need money immediately! As the name suggests, these types of cash loans are accessible online. You can get online cash loans directly from a lender or a broker like SwiftMoney. What�s there for Millennials in the Budget? Expectations vs. Reality. • Unmatched convenience: You can apply and get an online cash loan wherever you are as long as you have a computer/laptop or Smartphone and internet access. Unlike high street loans, you don’t need to visit a lender or broker physically to fill an application. Everything is done online! • Fast: Online applications are fast. It takes a minute to fill and submit a typical online loan application. The loan approval process is equally fast since the entire process is automated. Money transfer is also automated. It is possible to get money in a few minutes if you choose reputable online cash loan lenders in the UK like SwiftMoney. • You need a computer/Smartphone and internet access. • The loan amount is sent via bank transfer. You don’t get physical cash. • Loan applications can be declined. Different lenders have different loan approval rates. It’s therefore important to apply from a lender with a high loan approval rate. Swift Money has a 97.5% loan approval rate. You can also get emergency cash by making telephone loan applications to a lender of your choice. Most UK lenders accept this option, however, there are a number of shortfalls to consider. For instance, it may be difficult applying loans from busy lenders. Borrowing from lenders who have jammed phone lines most of the time may prove to be an exercise in futility. You may also be required to complete the application process offline. Unless you are a repeat borrower, your lender may require additional information from you before they process and approve your loan. Although it helps to choose a lender with a high loan approval rate, you are still not guaranteed you will get a loan when you apply for one. Considering most people apply for cash loans when they are in dire need of money, the last thing you desire is to have your payday loan application declined because of avoidable reasons. So, what should you do to increase your chances of securing a cash loan? First and foremost, it’s important to understand how cash loans work. Step 1: You need to fill an application providing personal details such as your; name, physical address, bank a/c information, the amount of money you want to borrow, etc. Step 2: You also need to read and agree to the terms and conditions of the loan i.e., the payment date, repayment amounts, interest, fees, etc. If you are applying for an online cash loan, loan applications are done online. Step 3: After submitting your application form, the lender will go ahead and assess the application. This process is important for verifying the accuracy of the information you have provided in your application. For instance, the lender needs to confirm if the employer you have provided is your real/current employer. A payday lender may also conduct a background check to assess your credit rating/history. Lenders also conduct affordability checks to ensure you are capable of repaying the amount you want to borrow. Please note: SwiftMoney offers bad credit cash loans which means you can apply and get a loan if you have a bad credit score or credit history. Step 4: If you have filled your loan application correctly, your application will be approved at this point. You should expect to receive cash immediately if you are working with a reputable lender. SwiftMoney understands the urgency associated with cash loan applications. For this reason, we release funds immediately once applications are approved. You should expect to receive the loan amount within a few minutes after your loan application is approved. Correspondence (email or text) is usually sent to keep you informed every step of the way. Money is sent to the bank a/c you have provided in your application or any other applicable payment method. Once you receive the money, you are free to spend it as you wish. However, it is advisable to borrow and spend money for the intended purpose to avoid financial problems in the future. Cash loans should be repaid in full plus interest with your next paycheck or according to any other repayment terms and conditions. In most cases, the repayment amount and date is usually fixed. SwiftMoney offers flexible terms. We can lend cash loans from £50 to £1000 or more depending on your borrowing history. Cash loan applications are declined for many reasons. Here’s what you must do to make sure your application is successful. • Be employed or have a regular income. For a cash loan application to be approved, all the information presented must be accurate. For this reason, you must fill the application honestly and carefully ensuring there are no errors including typos. Inaccurate or incorrect information can slow down the entire underwriting process and in some cases, result in a decline. Online loan applications are automatically rejected if they have the slightest errors i.e., a missing digit in an address. Applications with false information are also declined. As mentioned above, cash loan applications are assessed thoroughly. Background checks are usually conducted as part of the application assessment process so, false information can’t go undetected. Furthermore, you could face an investigation or prosecution for providing false information. To avoid wasting time and exposing yourself to legal problems, provide accurate information. Your chances of qualifying for a cash loan are lower if you have outstanding cash loans with other lenders or if you have large credit card debt/s. SwiftMoney can lend cash loans to individuals with bad credit. Most lenders shy away from such borrowers. You also need to apply for a loan you can pay back comfortably. Lenders usually assess the financial commitments of a borrower when processing applications. It’s also prudent to make this assessment yourself to avoid financial problems. You shouldn’t struggle to pay back a cash loan considering loan amounts are usually small. You can use a loan affordability calculator to calculate the amount of money you can be able to borrow comfortably. Such tools are readily available online. They assess a person’s income against their expenses to determine an appropriate debt burden at any given time. If you choose a cash loan provider like SwiftMoney with a high loan approval rate and follow the above information to the letter, you can rest assured your loan application will be approved. NB: If your short-term loan application is declined unfairly, you can always speak to your lender to get clarity on the reasons for the rejection. You may discover reasons beyond your control i.e., your credit file may have some incorrect information that needs to be removed/corrected. A good lender should give accurate feedback or guidance on all rejected applications. What makes SwiftMoney cash loans different? • 97.5% approval rate: SwiftMoney has one of the highest loan approval rates in the entire UK payday loan industry. We have approved over 400,000 loan applications since 2011. • No credit checks: We offer bad credit cash loans. It doesn’t matter if you have a poor credit score or history. You can still qualify for a SwiftMoney quick loan. • 100% online process: Our entire loan application and approval process is done online. You don’t need to visit us in person to qualify for a short-term loan. We have a fast and simple online loan application platform that allows you to do everything online in seconds. • Unmatched flexibility: You can borrow any amount you need from £50 to £1000 or even more if you have a good borrowing history with us. FCA approval: Regardless of your current financial situation, you must make sure you borrow from FCA approved lenders only. The FCA is the organisation responsible for regulating financial services firms in the UK. All FCA-authorised firms have met the highest operating standards. 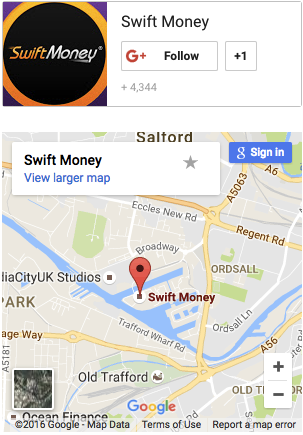 SwiftMoney is one of those firms. Our FCA-authorisation number is 738569. Interest: Interest is another important factor to consider. The loan provider you choose should charge a lower interest compared to most players. Check out our APR. Fees: The lender you choose shouldn’t charge any hidden fees. SwiftMoney charges zero fees. Fast: Cash loans are emergency loans which should be disbursed immediately. SwiftMoney loans are disbursed within 10 minutes once a loan application is approved. Call SwiftMoney on 0800 567 7444 or email: support@swiftmoney.com for more information on cash loans among other short term loans we offer. We are open 24/7. 9am-8pm on weekdays, 10am-5pm on weekends. The whole application process from start to finish can take as little as 60 seconds, providing that you have your more obscure details to hand, e.g. account number and sort code. This will help to speed up the application process. You may qualify to use our service if you are a UK resident with a regular income, aged 18 or over and have a bank account with a valid debit card. Can I apply for a loan even if I have bad credit? The short answer is yes. The majority of our lenders will base their decision on the credit history of the applicant but also take into account their present financial status. Most lenders reach their decision on the basis of whether you can afford to pay the loan back within the necessary time frame. This is completely dependent on the details provided during the application process and of course a credit check. How long will it take to receive the money? Once your loan has been approved, the funds can be deposited into your account in as little as 10 minutes (terms apply), although the process can take up to 3 business days. This is completely dependent on your bank. How is the money deposited? The funds will be deposited directly into your back account. To ensure that there are no delays, please check to ensure that your details are correct before submitting your application. Copyright © 2019 - Swift Money Ltd. Registered in England and Wales. SwiftMoney.com operate a credit brokerage service and is owned and operated by Swift Money Limited. Swift Money are not a direct lender. If you complete an application through our website, it will be shown to our lending and broker partners for their consideration. We do not charge any fees for the use of our service, but we do receive a commission from our lending and broker partners following successful introductions from our website. Any information we provide is for the purposes of illustrating the lending process only and should not be read as financial advice.